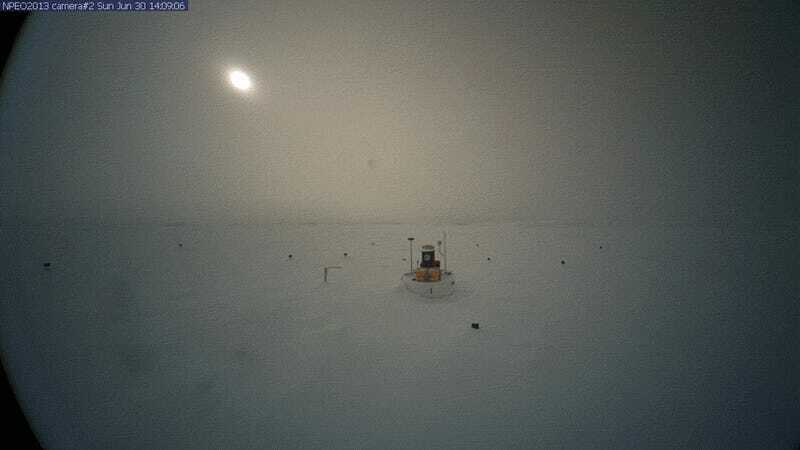 If you think these images from the North Pole look more like a lake than the snow-covered expanse you'd expect, that because it is is—the North Pole has melted. It's not, perhaps, quite as dramatic as it sounds. April saw the ninth heaviest snow cover on record measured in the Arctic, covering the Pole in more of the white stuff than it's seen in a long ol' time. But by May, temperatures increased and almost half the cover melted. Throughout July temperatures have been uncharacteristically high—up to 1-3°C higher than usual on July 13th, for instance—and the result has been an abrupt thaw of the snow cover that was left. These images, acquired from the North Pole Environmental Observatory, show the thaw in progress, between June 30th and July 25th.